“Mrs. Claus” and her volunteers gave out free, Christmas presents for children Wednesday, December 22nd behind our Customer Connection Center in Over-the-Rhine. Some people started lining up at 8 o’clock the night before. “Mrs. 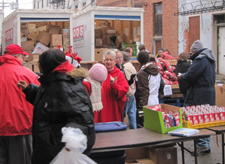 Claus” has been passing out gifts to those in need for the past 16 years.